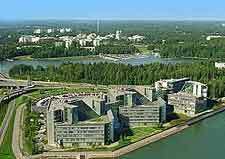 An independent city on the western outskirts of the Finnish capital of Helsinki, Espoo is actually extremely large and currently Finland's second-biggest. Espoo is a part of the overall Greater Helsinki area and as such, these two cities have many close ties and much of the population works in the capital and commutes daily. 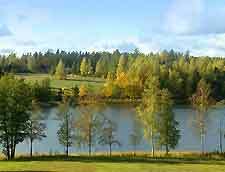 A pleasant and relaxing city, Espoo contains many large expanses of water and a number of central parks, and covers a vast area, sprawling outwards and containing a number of different town-size centres, together with many surrounding suburbs. One of the main centres in Espoo is the Tapiola district, which is often referred to as a garden city and successfully combines architecture with natural planting schemes, being filled with tourism options and contains plenty of sources of local tourist information. Westend is an especially wealthy and exclusive district, where many extravagant waterfront mansions reside. Kauklahti is one of the oldest districts in Espoo and recently played host to the Finnish Housing Fair, while Otaniemi is especially close to the Helsinki border and is where you will find the Helsinki University of Technology (TKK). Although many tourists choose to head to Helsinki to sightsee, there are a number of quality attractions within Espoo which deserve a mention. These include the Serena Water Park, which ranks as one of the very best in the whole of Europe and contains everything from swimming pools and lazy rivers, to water slides and exciting rapids. There is usually always something going on at the Espoo Cultural Centre, where are kinds of concerts are regularly staged. Still within the city environs, the Marketta Park is the biggest permanent garden exposition in the whole of Finland and completely free of charge. More information about Espoo Tourist Attractions and Landmarks. Whilst it is true to say that nearby Helsinki contains more museums than you could possible ever find the time to visit, Espoo too offers more than its fair share of culture, historical exhibits and information about the city's past. Finland's largest attraction of its kind, tourists flock to see the huge array of vehicles on show at the Espoon Automuseo, while others prefer the paintings and changing exhibitions at the Gallen Kallela Museum, next to the rather scenic Laajalahti Bay. 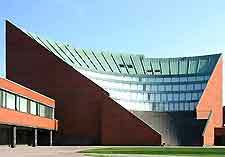 More information about Espoo Museums and Art Galleries. There is really so much of Southern Finland worth exploring, that tourists in Espoo should always leave some time for day trips. Helsinki is but a stone's throw from Espoo and this glorious capital is home to enough tourist attractions to keep you busy for months, so you will need to do a little research first and prioritise, although do consider a day at the Linnanmäki Amusement Park. Also, try to leave enough time to explore the Central Square of Keskustori at Tampere, the 13th-century castle at Turku, and the Heureka Science Centre at Vantaa. 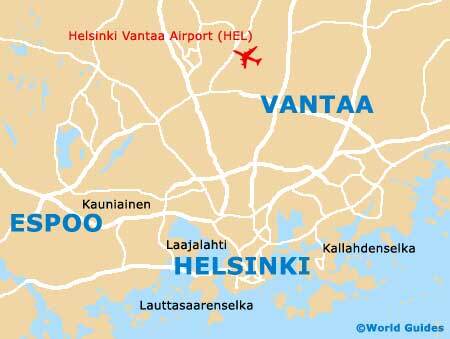 More information about Espoo Attractions Nearby.